For many people, the first visible signs of facial aging originate from the top of the head and move downward. As the skin on our forehead loosens, horizontal lines and hooded brows can form. Vertical lines between the brows can also become prominent due to overactive muscles and skin aging. This combination of characteristics can create the appearance of scowling, frowning, and/or exhaustion even when you may feel content and well-rested. For patients bothered by an aging forehead and brow line, we offer brow lift surgery which can restore a more youthful appearance. The endoscopic brow lift technique is one of the most popular rejuvenating procedures available today. 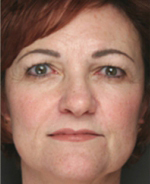 Plastic surgeon Christine Petti, MD is known for her expertise in endoscopic brow lift surgery, a technique which can smooth the forehead, eliminate furrows between the brows, and lift the brow line. This advanced approach to brow lift requires minimal incisions and a short recovery period, and the results are typically more natural-looking than were possible in the past. Candidates for endoscopic brow lift surgery are typically in good overall health and experiencing skin relaxation along the forehead and brow line that ages their facial appearance. Drooping eyebrows, hooded upper eyelids, and horizontal creases along the forehead are all signs that it may be the right time to consider a brow lift. If you are interested in finding out if endoscopic brow lift surgery is the right option for you, we encourage you to contact our office to schedule a consultation with Dr. Petti. Helping patients fight the aging process is what Dr. Petti loves to do best. She offers a wide range of facial plastic surgery options and non-surgical treatments to help both men and women achieve a more youthful and refreshed appearance. Often, Dr. Petti recommends that patients combine a brow lift with BOTOX® Cosmetic treatment and an eyelid lift to further rejuvenate the eyes and the forehead region. In some cases, where hollows have formed beneath the eyes, Dr. Petti may suggest dermal filler injections to restore diminished volume. Laser skin resurfacing is another popular facial rejuvenation procedure which diminishes wrinkles, age spots and other cosmetic concerns to reveal fresh, smooth, youthful skin. Numerous options are available and can be discussed during your consultation. Typically, Dr. Petti performs endoscopic brow lift surgery as an outpatient procedure with the patient under general anesthesia. Several tiny incisions are made within the hairline to keep them hidden after healing. Through these incisions, specialized surgical instruments help Dr. Petti lift the browline and smooth the forehead. As with all cosmetic procedures, she is mindful of maintaining a natural look that does not appear “overly done”. Once the lift is complete, the incisions are closed and bandaged. Other procedures can be performed during the same surgery for more comprehensive rejuvenation, convenience, and cost savings. Since the endoscopic browlift technique involves fewer incisions and reduces trauma to the tissue, the recovery period is generally less intensive than it would be following a traditional brow lift. The majority of Dr. Petti’s patients are able to return to work and their daily activities within a week; however each individual’s recovery may vary. Any light bruising or swelling tends to dissipate quickly, and the small hidden incisions generally heal quite rapidly as well. Dr. Petti’s expertise in endoscopic brow lift surgery allows her to deliver results that are both beautiful and natural-looking. Her goal is always to create a more rested and rejuvenated appearance that looks as though you’ve returned from a long, relaxing vacation, rather than a cosmetic surgery. Most often, Dr. Petti’s patients are very pleased with the results they are able to achieve with the endoscopic brow lift technique. Many report that, in addition to looking younger and more refreshed, their facial expression appears happier, more energized, and more approachable. 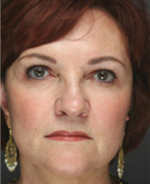 We encourage you to view brow lift before-and-after photos featuring Dr. Petti’s patients to see examples of her work. For more information about endoscopic brow lift and other facial rejuvenation procedures, contact our office to schedule a consultation with Dr. Petti.